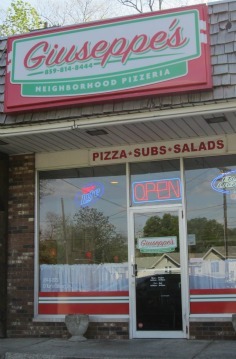 Tonight my family dined at a great restaurant in Covington, Giuseppe’s Neighborhood Pizzeria. The name ALMOST says it all. It is indeed a neighborhood restaurant, and they are indeed a pizzeria. But they offer so much more than pizza! They have salads, sandwiches (26! ), sides and also a pretty cool selection of beers, and all of their menu items have fun names. We dined on a Levassor Park Garden (perfect for veggie lovers – green peppers, tomatoes, mushrooms, green & black olives and feta – see picture at right), the kids had a half pepperoni/half sausage pizza, and we had a side of loaded fries. YUM. It took me forever to decide on what to get because there were so many choices that sounded appealing. 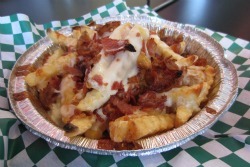 I loved the Levassor Park Garden – it was a perfect blend of flavors & toppings, but I cannot wait to go back and try the Peaselburger (a bacon cheeseburger pizza!). All of the food at Giueseppe’s is home-made…the dough, the sauce, and twice a week they have a “Pasta Night” with homemade Lasagana or Spaghetti & Meatballs, and all of their veggies are fresh. I wasn’t the only one happy with our dinner, the kids chowed down on the pizza & fries! Check out their menu, they have several “Neighborhood Pizzas” that are named after local neighborhoods and have a fun mix of toppings. OR you can always pick your own toppings. Giuseppe’s is locally owned and has awesome service. Our waitress was so sweet & attentive, and the food was ready in a jiffy. I loved that we could see all of the action going on in the kitchen, and that the owner was right there in the midst of it making pizzas & chatting with the customers. He went around to every single table and made sure that everyone was happy with their food. He knew many of the folks by name. I love eating at restaurants that have that “neighborhood hangout” sort of feel to them. There was quite a mixed group at the restaurant while we were there…many folks coming in to pick up carryout, a few families, some ladies meeting for pizza & beer after work, a single guy watching baseball and enjoying a hoagie, and a few friends catching up. We all enjoyed the decor at the restaurant – it was a bright and bold display of Italian heritage & Covington pride. 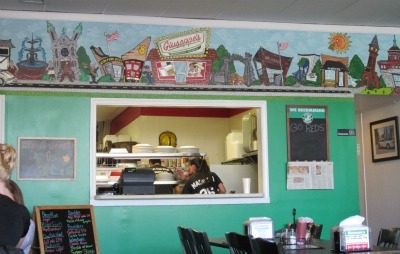 Two walls are painted like the Italian flag, and decorated with pictures from around Covington. And above the kitchen window is a cool mural of Covington landmarks. Giuseppe’s is tucked away in a small set of shops at 2607 Madison Avenue in Covington. It is not a large restaurant, there are only eight tables, but hey, if you show up and they are full you can always carry out! I watched the carryouts, and it seemed that the orders were ready quite quickly. Giuseppe’s also delivers anywhere in Covington (I’m sort of bemoaning the fact that I live outside their delivery zone, thank goodness there’s carryout!). And their food is VERY reasonably priced – I could not believe how much food we got for under $30. 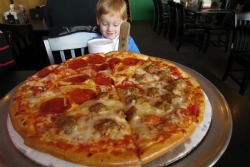 If you are looking for a family friendly place to grab a pizza, sandwiches or salads head to Giuseppe’s! And after you have your fill, drive a few blocks to Dari Crest (read Michelle H’s post about them here). 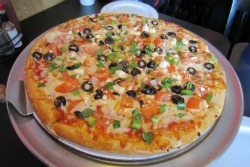 Excellent pizza!! But every bit as impressive was the friendly staff and just the overall neighborhood feel of the place. Try Giuseppe’s. You won’t be sorry that you did.